The post and beam barn is a beautiful setting for weddings and events. 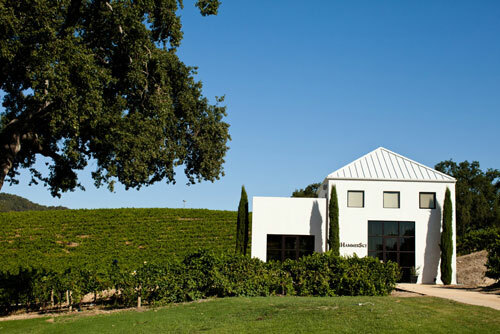 –In the heart of westside Paso Robles on Vineyard Drive, HammerSky Vineyards offers it all. 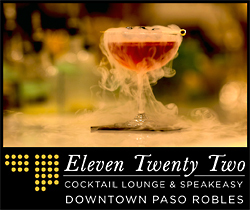 The ultra-modern tasting room offers award-winning Bordeaux wines, hospitality, and comfort for all who visit. When Douglas Hauck bought the 50 acres within the Adalaida/Willow Creek AVA property in 2007, he knew the vineyard was a gem. 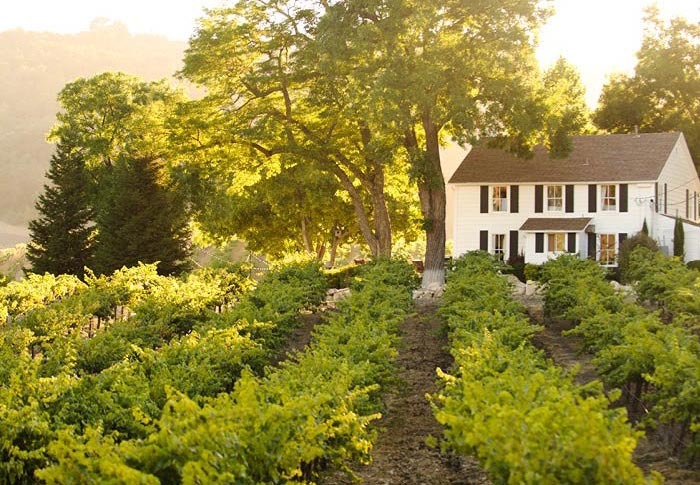 His vision was to restore the historic century-old farmhouse and perfect his vineyard practices. The dream is now a reality and Doug invites you to indulge in the elegance and romance that is HammerSky. Truly a unique and picturesque property, Doug tastefully enhanced the historic site to be a working winery and inn that he can share with others. The restored farmhouse inn boasts casual elegance. Built by a Mennonite minister for his family in 1904, the gleaming white house at HammerSky Vineyards embraces its history. Despite the home’s age, its crisp black shutters, second-floor balcony, and cropped boxwood hedge reveal a contemporary aesthetic. It has been described as the Scarlet O’Hara/Great Gatsby House. The original windows incorporate views of a 300+ year-old valley oak tree, affectionately known as Uncle Dan. Doug also erected a post-and-beam Yankee barn behind the house for special occasions. The tasting room at HammerSky Vineyards. HammerSky has graced many magazines such as Vogue Magazine, Los Angeles Times, 805 living, C Magazine and Pottery Barn, to name a few. HammerSky is becoming well known for the fine handcrafted wines as well as an upscale venue for intimate special occasions. Look for more photos on Pinterest, Modern Bride, Mag Rouge, Destination I Do Magazine and Instagram. A man of diverse interests, Doug earned a business degree from the University of Southern California, a film degree from the University of California, Los Angeles, and, in 1988, a Doctorate of Dental Surgery from San Francisco’s University of the Pacific. He taught dental courses at USC, ran a successful practice in Beverly Hills for two decades, and has enjoyed side careers as a movie producer and Internet entrepreneur. Doug continues to maintain his successful dental practice in Orange County, where he counts sports, music, and film celebrities among his clients. The Inn at Hammersky. Photo from Hammersky.com. Doug’s eclectic sense of style is especially evident in the tasting room, which stands at the edge of a park-like lawn dotted with large oak trees and picnic tables. The clean lines and smooth, steel-troweled walls of the snow-white structure creates a bold impact amid the rural setting. The building, completed in 2011, is just under 1,000 square feet and allows a relaxing, airy space for wine tasting, as well as a barrel room splashed with red and black accents. 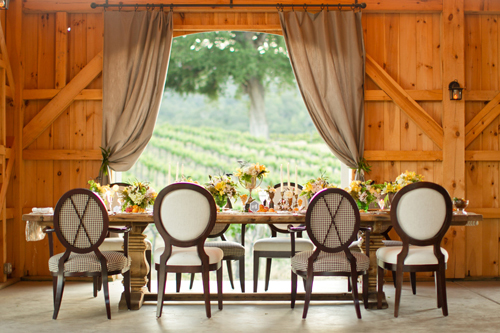 Tall windows and glass doors emit natural light, while allowing sweeping views of the merlot vines that border the lawn and café-style seating on the patio – it has been referred to as the best picnic location in Paso Robles. Whether you are looking to enjoy fine estate wines, or to relax in a historic farmhouse amidst a working vineyard, you will find HammerSky to be more than you imagine. The tasting room is open daily, closed only on Wednesdays, and the farmhouse is rented year-round. Doug and the friendly staff welcome you to come enjoy the HammerSky wines in the most scenic vineyard setting. HammerSky is a sustainable property. Their 20-year-old vines are well established and require very little water. Tesla charging station available. HammerSky Winery tasting room is open Thursday to Sunday 11 a.m. to 5 p.m. and by appointment. For more information visit hammersky.com or call (805) 239-0930.